Commercial property agent Knight Frank has appointed Peter Whiteley as head of the Sheffield office and promoted Ben White to associate in its South Yorkshire team. 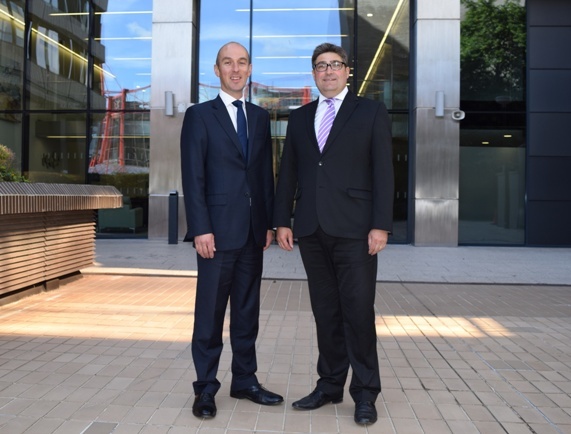 Partner Peter, who has been with Knight Frank since 1990, takes over running the Sheffield office from Stephen Hodgson who retired earlier this year after 28 years in charge in the city and as group regional commercial head. Peter started as a graduate surveyor moving up the ranks to partner in 2000 where he became head of agency and now head of office. The Sheffield office comprises a team of 20 and has an enviable reputation in the commercial property sector. He said: “I am delighted to take over the head of office in Sheffield from Stephen. We have a very well respected and established team providing our clients with an in-depth knowledge and expertise in the commercial property sector. Notable schemes Peter has been involved with include Victoria Quays / Canal Basin, delivering 140,000 sq ft of offices which attracted occupiers Nabarro, Nathanson, Parexel and Lloyds; and the redevelopment of the former Whitbread Brewery Site, known now as Riverside Exchange – delivering 375,000 sq ft of offices and attracting occupiers including Irwin Mitchell Solicitors and The Home Office. He also worked on the landmark Heart of the City project – St Pauls Place, comprising 220,000 sq ft of offices overlooking the Peace Gardens with occupiers including DLA Piper, Barclays, RBS, PWC, Department of Education and Skills, and most recently Arup; the 200-acre development at Sheffield Business Park with occupiers including South Yorkshire Police, The University of Sheffield, HSBC and SIG Group plc to; and secured 1,100,000 sq ft of distribution warehouses for Next at Brookfields Park, Dearne Valley. Peter added: “Stephen opened the Sheffield office 28 years ago and over this time we have been a driving force in the city’s development, helping to bring some of the biggest commercial property deals to completion and creating one of the most highly regarded commercial property agencies in the region. Ben joined Knight Frank in July 2014 as a senior surveyor to work alongside clients and developers across the Sheffield City Region. He had previously held roles at CRBE in Leeds, East Yorkshire’s PPH Commercial and Foxtons in London. His involvement has secured major deals in the region including Tommy Tucker’s 42,000 sq ft occupation at Target Park, Dinnington. He also acted on behalf of KPMG in its recent acquisition of a new office in Sheffield City Centre at The Balance and the disposal of a 152,000 sq ft industrial unit purchased by TGB on Chesterton Road, Rotherham. Ben and Peter work alongside Tom Swallow and Rebecca Schofield as Knight Frank’s award winning agency and development team in Sheffield. Rebecca is currently shortlisted as Property Personality of the Year 2016 in the Yorkshire Business Insider’s Property Gala Dinner. The Yorkshire team has won numerous industry awards including most active industrial team in Yorkshire three years running from EGi National Deals competition and Yorkshire Insider Office and Industries Agency Teams of the year.